Science fiction books are easily one of my favourite genres of literature. Allow me to share my top five picks for the perfect sci-fi read. After my (quite scathing) review of Only Ever Yours last week I had a lovely comment from Sam of Momentarily Dreaming suggesting that I do a round up of my favourite science fiction novels. I was initially going to fill this up with classics such as Nineteen Eighty Four but instead I’m taking the chance to sneak in some favourites that are either a little too unknown or that you may not have considered to be sci-fi at all. I’m fairly certain that The Handmaid’s Tale is the novel that Only Ever Yours was based on as the latter seems to have structured its world quite similarly. 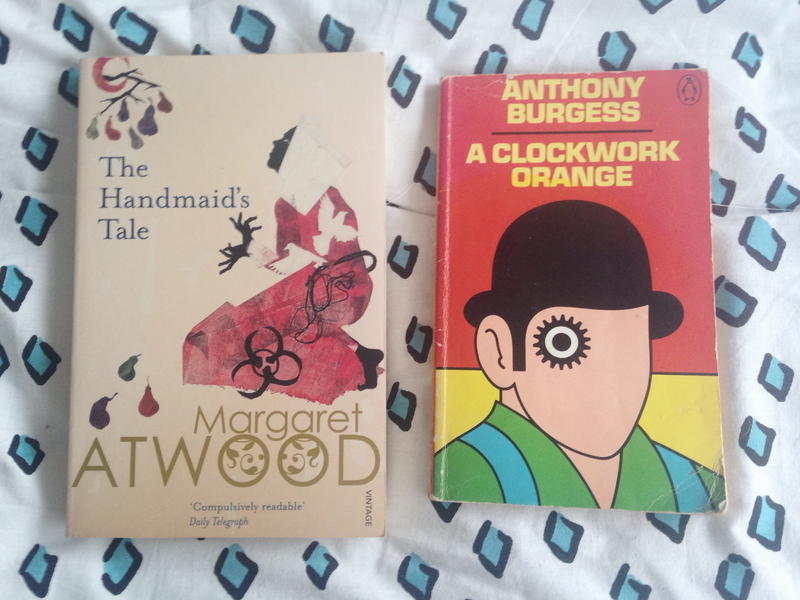 The Handmaid’s Tale is often spoken about as an extremely feminist text as it focuses on the roles of women following the collapse of American civilisation as it falls to devout old-testament Evangelists. The reason I find the novel so effective is how believable Margaret Attwood has made this dystopia seem and how every chapter leaves you with chills. You can vividly imagine every passage and description and so much seems to be rooted in our current reality (without relying too heavily on it) that you’re left feeling uncomfortably wary of the future. Despite being chock full of violence and discomfort, A Clockwork Orange has a massive cult following obsessed with the messages Anthony Burgess puts out. Following Alex de Large, a young lad in a thuggish gang, this book blurs the lines of hero and villain leaving you a little confused over your own morals. I was hesitant to include this as the sci-fi aspect, the heavy presence of conversion therapy, isn’t too far removed from our own world but the critical message of the controversial procedure that is being conveyed won it a place. A Clockwork Orange is one of those novels that has so many layers to it and so much cultural influence that you can never quite learn all there is to know about Alex de Large’s world. 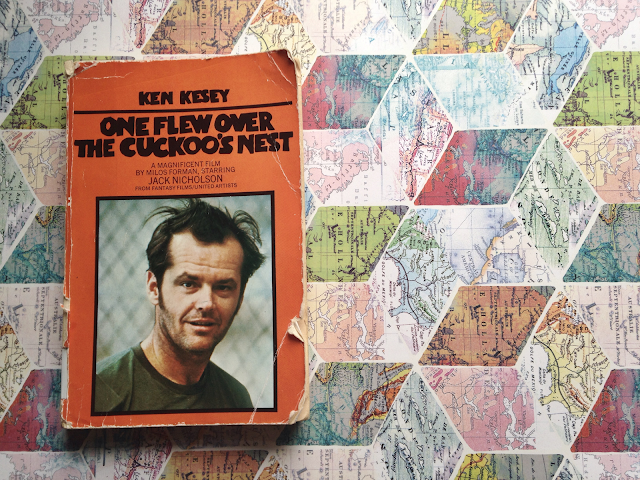 The book is infamous and was banned in many countries, the film adaptation was even banned in the UK at Stanley Kubrick’s request after his family started receiving death threats and was only made ‘legal’ when Kubrick passed away. It’s only short but challenges you with a new language, Nadsat, based on Russian and Cockney that you’ll pick up surprisingly quickly, if there’s a singular book to take away from this post, this would be it. In the year 2140, it is illegal to be young. Children are all but extinct. The world is a better place. Longevity drugs are a fountain of youth. Sign the Declaration, agree not to have children and you too can live forever. Refuse, and you will live as an outcast. For the children born outside the law, it only gets worse – Surplus status. I first read The Declaration a few years ago, before the dystopian trend in YA fiction had really taken off. Based in a disease and death free UK, faced with the problem of over population, a declaration has been ruled that anyone wishing to take death-defying drugs must forgoe their right to have children. The story follows Surplus Anna, a child born to parents taking the drug, her approach to a life of servant in the world outside her school and the new arrival who’s about to change things up. The Declaration is on the same vein and level as books such as The Hunger Games and Only Ever Yours so I’d recommend it to anyone hesitant to try anything too heavy going. I think the fact that Malley sneaked this in before all the good dystopian ideas were gone really helps make the story stand out as the concept is conveyed a lot more naturally than some YA fiction I’ve been reading. As children, Kathy, Ruth, and Tommy were students at Hailsham, an exclusive boarding school secluded in the English countryside. It was a place of mercurial cliques and mysterious rules where teachers were constantly reminding their charges of how special they were. Now, years later, Kathy is a young woman. Ruth and Tommy have reentered her life, and for the first time she is beginning to look back at their shared past and understand just what it is that makes them special–and how that gift will shape the rest of their time together. 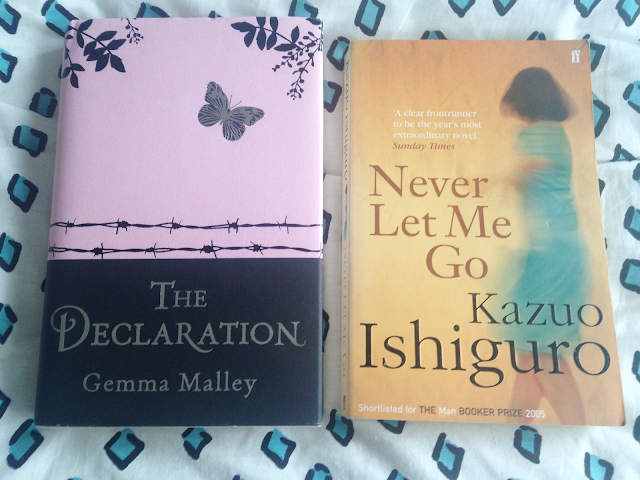 Never mind my favourite science fiction reads, Never Let Me Go is one of the favourite books in my collection and a novel I’ll happily read again and again. Never Let Me Go is set in the past but in an alternate reality where the moral ethics of cloning and medicine are vastly different to our own. Kathy, Ruth and Tommy are three friends who have known each other since school but have let themselves grow apart from one another. The novel is based around Kathy remembering their lives together and reflecting on how heartbreaking-ly extraordinary their fate is. There’s a lot of emotion in Never Let Me Go and it’s difficult to not find yourself crying at its conclusion. Despite their situation being so far removed from your own you can’t help but empathise with the characters and, without ruining the plot, it’s what makes their fate so disturbing. This final book could be a little bit of a cheat as there are many parts of the definition of ‘science-fiction’ that it doesn’t necessarily confirm to. Rather than being based around speculative concepts of the future Mr Penumbra’s 24-hour Book Store combines old fashioned mystery and dusty books with online technology and the age of Google. Nonetheless, as a book I could read over and over again, it deserves a place in this list as an alternative look at science fiction in a modern setting. 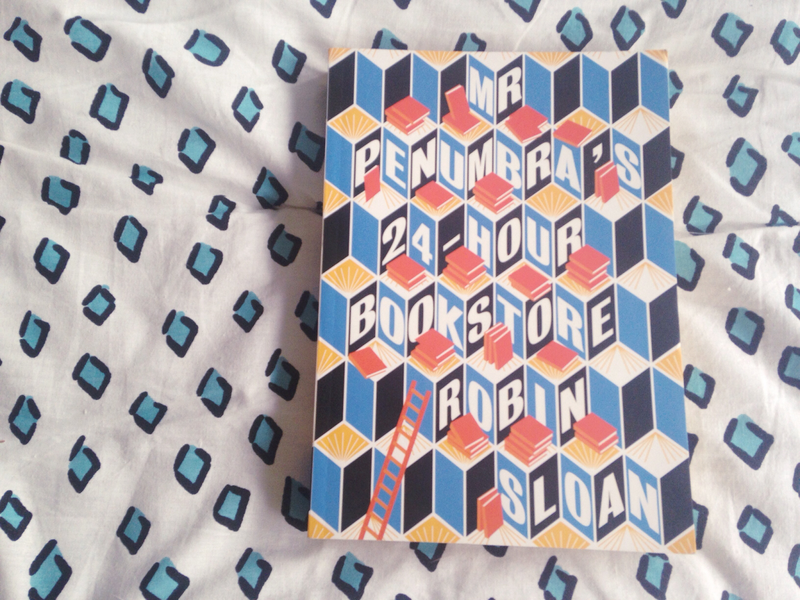 I’d pretty much describe Mr Penumbra as free-masonry meets modern technology and if you love a good mystery novel you should be giving this a flick through at your next opportunity. Robin Sloan has blended the two worlds together well instead of forcing the odd combination and you’re left wanting to know what happens next. Many thanks again to Sam as I really enjoyed writing this blog post (and I hope you enjoyed reading it)! I’d love to do more of these in the future for different genres though, as my reading tastes are a little varied, I’m not certain what genres I’d be able to cover. If there’s any that you’d really enjoy reading about then please comment below with a recommendation!